Reverend Edward Pinkney, 69, the veteran community activist gained a major win over Berrien County, Michigan, where he was charged, convicted and imprisoned for election forgery. The Michigan Supreme Court agreed with a unanimous 6-0 vote to throw out the charges against Rev. Pinkney. The former political prisoner talked to The Final Call about what the May 1 court decision meant in an exclusive interview. Rev. Pinkney was convicted in 2014 on an election related forgery charge in Benton Harbor, Mich., by an all-White jury and sentenced to two and a half to 10 years in prison. Rev. Pinkney served the two and a half years and was released before the high court reversed the conviction. For Rev. Pinkney and his supporters the charge and conviction were a travesty of justice. They consistently argued that there is no such charge as forgery on a recall petition. The high court justices determined that Rev. Pinkney was “not properly charged” and thus falsely convicted of election-law forgery. “Therefore, his convictions must be vacated, and the charges dismissed,” court documents said explaining the decision. The case stemmed from an active petition effort to recall then Benton Harbor Mayor James Hightower. Slightly over 300 names were required, and the activist collected over 700. The Benton Harbor clerk disputed five signatures that triggered the activist’s arrest, that many believe was a politically motivated ruse against Rev. Pickney. Benton Harbor is 83 miles from Grand Rapids and has a population of 9,860 and Blacks make up about 85 percent of the population according to the U.S. Census. “It’s crystal clear that Berrien County has an axe to grind with Rev. Pinkney,” said current Benton Harbor Mayor Marcus Muhammad. Berrien County, reputed to be highly racist, lost a legal battle once before to the Reverend in 2009. At the time he was placed in prison, accused of violating his parole and threatening a judge with a bible verse. The higher court ruled against Berrien County forcing them to release him. In both instances Rev. Pinkney triumphed against a system notorious for railroading people, said Mayor Muhammad. “It’s a great victory … where a judicial system lynches and hangs Black men and women with trumped up and false charges,” said Mayor Muhammad. “The Honorable Minister Louis Farrakhan told me ‘you have to see Reverend Pinkney suffering, because if it was not for him, you would not be in the esteemed position to run for the mayor of the city of Benton Harbor,’” said Mayor Muhammad. In 2015 he won in the largest landslide in the city’s history against the incumbent Mayor. Mayor Muhammad is also a student minister in the Nation of Islam. The Honorable Minister Louis Farrakhan was a supporter of Rev. Pinkney. He explained his spirit was to never back down when the authorities began angling charges against him. “I come to fight,” he told supporters during the trial. “There’s not a time in my life; if they say that I did something—bring it on,” Rev. Pinkney said. “I wanted them to know that I’m not one of them every day Black men out here … I’m out here to fight for the people,” he said. Although he has a track record of standing up, some people in the community distanced themselves from Rev. Pinkney and his wife while he was jailed. They weren’t sure, and some began to believe the charges. The court victory was a needed shot of hope for the community. Since the announcement, he drives down the street and people wave, they want to talk again and show support. When asked if he planned to take legal action for what happened to him, he responded, “We do have that as an option and we are weighing all that as we speak … there will be something.” Unity is what Rev. Pinkney wanted out of his ordeal. “It’s not only about Reverend Pinkney, it’s about the future of our children,” he said. The outspoken pastor has been on the front lines fighting against gentrification issues along with other economic and social injustices adversely affecting everyday people. When asked where he goes from here, the reverend activist said his church is called God Household of Faith that includes a trade school with a training program called, “Attacking Our Community.” People will be trained in trades like carpentry, brick masonry, plumbing, and electrical work. He is also involved in an anti-gentrification campaign against the upcoming 2018 Senior PGA golf tournament. Rev. Pinkney and Occupy the PGA organizers are protesting moves by Harbor Shores Development, Whirlpool and the PGA, whose development projects have negatively impacted Black residents who lived in Benton Harbor for generations, and now are being pushed out, they argue. 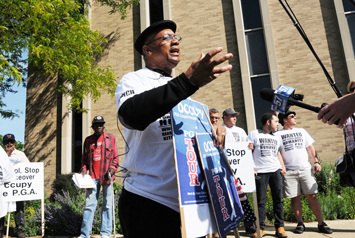 “Benton Harbor continues to be a city under siege,” Rev. Pinkney said. “It is a Coup d’ tat in Benton Harbor by Whirlpool Corp. The mishandling of public trust couldn’t be more massive, unjust, inhumane, and unconstitutional.” So, for Rev. Pinkney, the fight continues, only with renewed energy over the court decision. “It had uplifted this whole community, even though I had to spend 30 months in prison, the good news is that we achieved something during that process,” said Rev. Pinkney.